GAZA CITY, Gaza Strip An Israeli missile flattened a two-story house in a residential neighborhood of Gaza City on Sunday, killing at least 11 civilians, mostly women and children, Palestinian medical officials said, as Israel expanded a military offensive to target homes of wanted militants. The attack, which Israel said targeted a militant, was the single deadliest incident of the five-day-old Israeli operation and hiked a toll Sunday that was already the highest number of civilians killed in one day, according to Gaza medics. The bloodshed is likely to raise international pressure for a cease-fire, with Egypt taking the leading role in mediating between Israel and Hamas. President Barack Obama said he had been in touch with the leaders of Israel, Egypt, and Turkey in an effort to halt the fighting. "We're going to have to see what kind of progress we can make in the next 24, 36, 48 hours," he said. Obama cautioned against a potential Israeli ground invasion into Gaza, warning it could only deepen its death toll. At the same time, he blamed Palestinian militants for starting the round of fighting by raining rockets onto Israel, and he defended Israel's right to defend itself. "Israel has every right to expect that it does not have missiles fired into its territory," Obama said in Thailand at the start of a three-nation tour in Asia. An Israeli envoy arrived in Cairo on Sunday and held talks with Egyptian officials on a ceasefire, according to Egyptian security officials and Nabil Shaath, a top aide of Palestinian President Mahmoud Abbas who was in the Egyptian capital. But Israel and Gaza's militant Hamas rulers remain far apart on any terms for a halt in the bloodshed, which has killed 70 Palestinians -- including 36 civilians, according to Gaza health officials -- and three Israeli civilians. Hamas is linking a truce deal to a complete lifting of the border blockade on Gaza imposed since Islamists seized the territory by force. Hamas also seeks Israeli guarantees to halt targeted killings of its leaders and military commanders. Israeli officials reject such demands. They say they are not interested in a "timeout," and want firm guarantees that militant rocket fire into Israel will finally end. Past ceasefires have been short lived. As the offensive moved forward, Israel found itself at a crossroads -- on the cusp of launching a ground offensive into Gaza to strike an even tougher blow against Hamas, or pursuing Egyptian-led truce efforts. "The Israeli military is prepared to significantly expand the operation," Israeli Prime Minister Benjamin Netanyahu declared at the start of the weekly Cabinet meeting. Obama: Israel has "right to defend itself"
At the same time, Gaza militants continued their barrage of rocket fire at Israel, firing more than 100, including two at Tel Aviv. More than 10 Israelis were injured by shrapnel, two moderately, according to police spokesman Mickey Rosenfeld. Israel's "Iron Dome" rocket-defense system shot down at least 30 rockets, including the ones aimed at Tel Aviv. Israel's announcement Sunday that it was widening its campaign to target homes of militants appeared to mark a new and risky phase of the operation, given the likelihood of civilian casualties in the densely populated territory of 1.5 million Palestinians. Israel launched the offensive Wednesday in a bid to end months of intensifying rocket fire from the Hamas-ruled Gaza Strip. 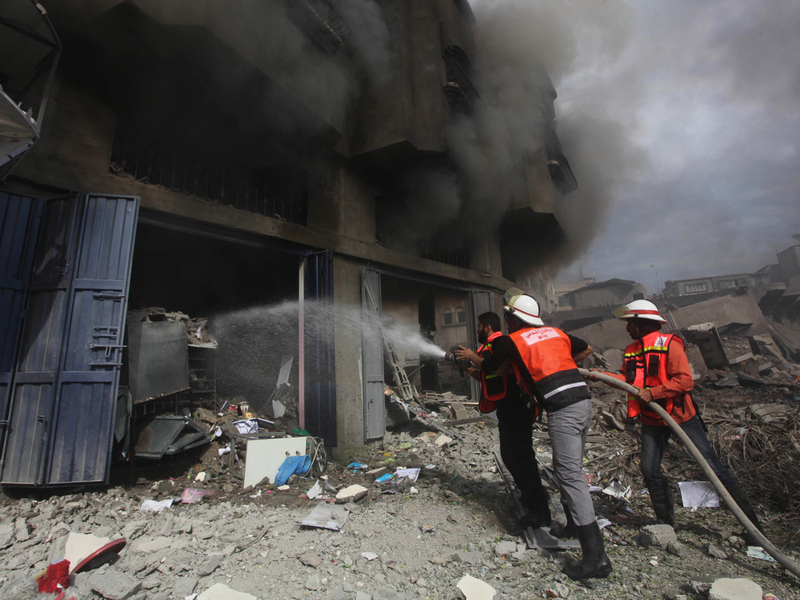 The day's deadliest strike hit the home of the Daloo family in Gaza City, reducing the structure to rubble. Frantic rescuers pulled the bodies of several children from the ruins of the house, including a toddler and a 5-year-old, as survivors and bystanders screamed in grief. Later, the bodies of the children were laid out in the morgue of Gaza City's Shifa Hospital. Among the 11 dead were four small children and five women, including an 80-year-old, Gaza health official Ashraf al-Kidra said. In a statement, U.N. Secretary-General Ban Ki-moon said he was "deeply saddened" by the deaths of the civilians and "alarmed by the continuing firing of rockets against Israeli towns." Israeli military spokesman Brig Gen. Yoav Mordechai told Channel 2 TV that the Israeli navy had targeted the building and killed a "global jihad" militant. "The targets are exact," Mordechai said. "Every (Israeli) missile has an address." He said the army would continue its operation "as if there were no (cease-fire) talks in Egypt." The presence of a militant in the house could not be verified. Al-Kidra said the two adult men killed in the strike were civilians. Sami Abu Zuhri, a Hamas spokesman, said that "the Israeli people will pay the price" for the killing of civilians. One of the rocket attacks targeting Tel Aviv came soon after the strike on the Daloo home. More than a dozen homes of Hamas commanders or families linked to Hamas were struck on Sunday. Though most were empty -- their inhabitants having fled to shelter -- at least three still had families in them. Al-Kidra said 19 of the 24 people killed Sunday were civilians, mostly women and children. Israeli Vice Premier Moshe Yaalon said civilian casualties are inevitable. "You can't avoid collateral damage if they position the rockets in densely populated areas, in mosques, school yards. We shouldn't be blamed for the outcome," he said. Israel also struck two high-rise buildings housing media outlets, damaging the top floor offices of the Hamas TV station, Al Aqsa, and a Lebanese-based broadcaster, Al Quds TV, seen as sympathetic to the Islamists. Six Palestinian journalists were wounded, including one who lost a leg, a Gaza press association said. Foreign broadcasters, including British, German and Italian TV outlets, also had offices in the high-rises. Two missiles made a direct hit on Al Aqsa TV's 15th floor offices, said Bassem Madhoun, an employee of Dubai TV, which has offices in the same building. Building windows were blown out and glass shards and debris were scattered on the street below. Some of the journalists who had been inside the building at the time took cover in the entrance hallway. Lt. Col. Avital Leibovich, an Israeli military spokeswoman, said the strikes targeted Hamas communications equipment on the buildings' rooftops. She accused the group of using journalists as "human shields," and urged journalists to stay clear of Hamas bases and facilities. The repeated militant rocket fire on Tel Aviv and a volley fired Friday toward Jerusalem have significantly escalated the hostilities by widening the militants' rocket range and putting 3.5 million Israelis, or half the country's population, within reach. The attempt to strike Jerusalem also has symbolic resonance because both Israel and the Palestinians claim the holy city for a capital. Israeli radio stations repeatedly interrupted their broadcasts to air "Code Red" alerts warning of impending rocket strikes. In the southern city of Ashkelon, rocket fire damaged a residential building, punching a hole in the ceiling and riddling the facade with shrapnel. With fighting showing no signs of slowing, international attempts to broker a ceasefire continued. Nabil Shaath, an aide to Palestinian President Mahmoud Abbas who was in Cairo, confirmed that the Israeli envoy had arrived in Egypt for talks, saying there are "serious attempts to reach a ceasefire." There was no immediate Israeli confirmation. Hamas' prime minister, Ismail Haniyeh, spoke to Egyptian President Mohammed Morsi. He told the Egyptian leader he supports such efforts, provided Hamas receives "guarantees that will prevent any future aggression" by Israel, his office said in a statement. Morsi over the weekend hosted talks with Hamas' supreme leader, as well as leaders from Hamas allies Turkey and Qatar. He also held contacts with Western leaders. French Foreign Minister Laurent Fabius visited Israel on Sunday to offer his country's help toward forging an "immediate ceasefire," the French government said. Meeting with Fabius, Israeli Foreign Minister Avigdor Lieberman thanked him for "France's efforts to prevent casualties" but said "the moment that all the terror organizations announce a ceasefire, we can consider all the ideas that French foreign minister and other friends are raising."